As soon as I hit "Publish" on that last post, I cast on for a swatch in the recommended needle size (US 7). Because the sweater is knit-in-the-round and my gauge is slightly different than when I knit flat, I used 12" circular needles for the swatch. Apparently, I purl a bit looser than I knit. In any event, before long I had a good size swatch soaking, but a pre-wash stitch count showed I had far too many stitches per inch to obtain gauge (15.5 sts/4 inches or 3.875 sts/inch) for the pattern. 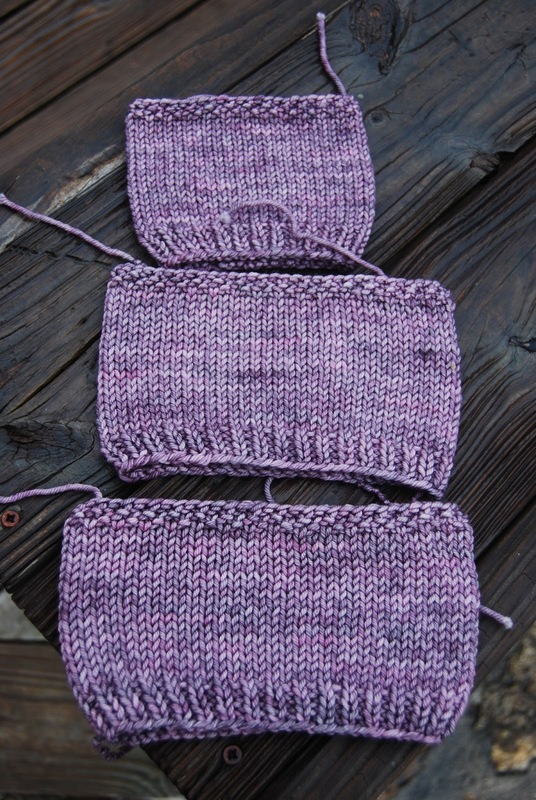 Thus, I began swatching with US 8 needles, I am methodical that way. Even though I have never-ever had to go up more than one needle size than what was recommended in the pattern, I had to make a third swatch using a US 9 needle. To be honest, I was surprised I even had one because I typically loathe using anything larger than a US 8. As I worked away on the US 9 needles, I just knew this one would give me gauge. When I finished, I did not even bother to take a pre-wash count, just soaked it for an hour, rinsed, pressed the water out, and allowed it to dry. I am now at 17 sts/4 inches or 4.25 sts/inch, rather than the mandated 15.5 sts/4 inches or 3.875 sts/inch. 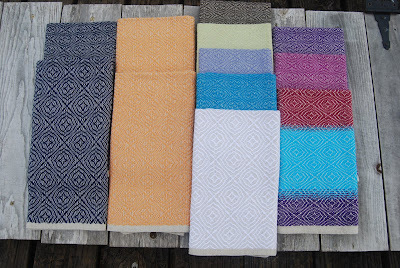 I am now three swatches in and wondering if I have a US 10 or US 10.5 needle. I am also questioning whether I even WANT to knit ANYTHING with those size needles. While I had a 12" circular needle for the US 7 needles, the smallest I had for the other two were 16". The yarn I am using is worsted (Madelinetosh Vintage). According to Ravelry, this yarn is supposed to knit between 18 and 20 stitches/4 inches with US 6 or 7 needles. The yarn called for in the pattern is also worsted (Quince & Co. Owl). Also based on Ravelry, Owl is supposed to knit between 18 and 20 stitches/4 inches with US 6 or 7 needles. Therefore, the yarns appear to be an accurate substitution for one another. It occurred to me that, perhaps, there was an error as to needle size in the pattern. A check of their errata page revealed nothing with respect to Larch. Do not get me wrong, I wholly understand the size of the needle is actually irrelevant, as long as gauge is obtained. 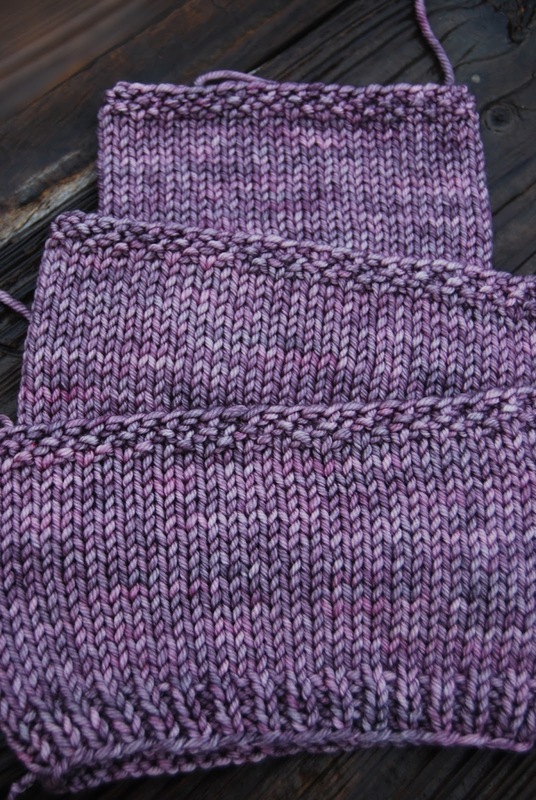 I am just a bit frustrated that I am three swatches in and only minimally closer to that magic gauge number. But for the love of the yarn, all this swatching is slowly sucking the life out of my desire to knit this. I liked the fabric the US 7 needles made, but it was a bit tight and lacked drape. The US 8 needles produced a slightly looser fabric, but one I actually liked, too. I have an aversion for loose stitches because the garment grows with wear while it is still on the body. I had no hope that I would like any kind of fabric the US 9 needles could produce. There is nothing quite like walking out of the house with a sweater that graces the hip/leg joint, only to return hours later with the same sweater hanging loose about the knees. 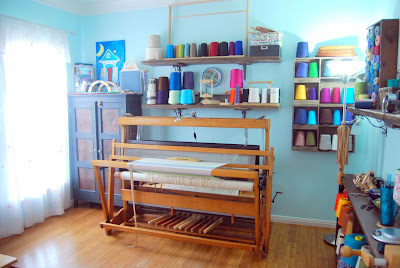 The good news is that I can actually live with US 9 needle fabric. It is loose, but not wonky loose. There is still good stitch definition. Before I even consider a 4th swatch with US 10 needles, a did a bit of math. As noted twice already, 15.5 stitches per 4 inches equals 3.875 stitches per inch. The gauge with US 8 needles gave me 18 stitches per 4 inches or 4.5 stitches per inch, and the US 9 needles gave me 17 stitches per 4 inches or 4.25 stitches per inch. Over 100 stitches, a gauge of 3.875 stitches/inch equals 25.8 inches. That is achieved by dividing 100 by 3.875. Over that same 100 stitches, a gauge of 4.25 stitches/inch equals 23.52 inches. Again, I simply divided 100 by 4.25. 23.52 inches is 91.2% of 25.8. I divided 23.52 by 25.8. Okay, so what does that 91.2% tell me? It tells me that if I wanted to use the US 9 needles with a gauge of 4.25 sts/inch to knit a finished size of 45.5" in circumference, my sweater would actually be 41.47" around. That is not good; however, if I moved up to the next stated size of 49.5", then my finished size would be 45.14", which is much better and nearly the original size desired. The goal for me is to make a sweater that fits and that is made of a fabric most pleasing to the wearer. If the size desired is one between 45 and 46 inches in circumference, then altering the gauge and moving up a pattern size is a win. Although, I must add a caveat here: Read the pattern carefully. If the pattern is written with a specific number of rows, rather for inches, then altering the gauge is probably not going to work. Stitch gauge and row gauge are closely related. 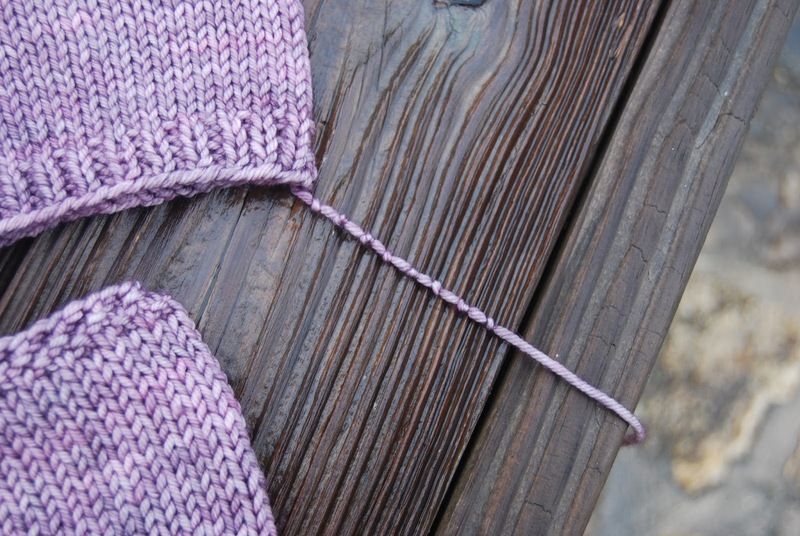 The tighter the gauge (higher the stitch count), the larger the number of rows per inch, as well. Most of the patterns I knit use inches to mark body length, shoulder height, and sleeve length. 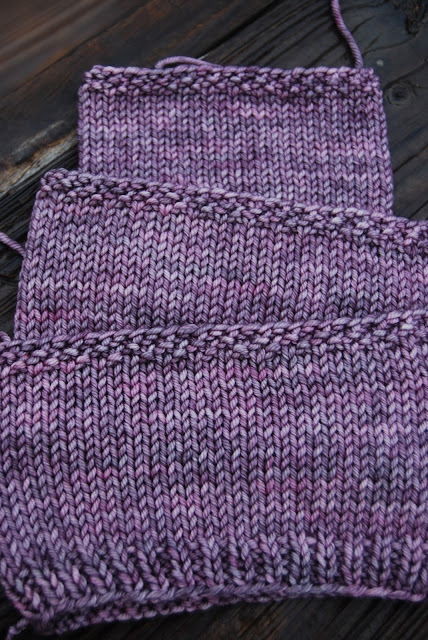 That said, if the sleeves are attached with a yoke or raglan design, changing the gauge will certainly affect the outcome and the fit, even if the circumference is perfect. The Larch pattern is basically a rectangle for the body. The sleeves are not set in, either. This means it is a perfect candidate for altering the gauge (and the row count). So, the second part of the sweater goal is whether it is made of a fabric most pleasing to the wearer. Larch is described in the pattern as follows: "The simple details of this piece combined with miles and miles of quick-gauge stockinette makes this a soothing knit for the busy brain." This, along with the gauge of 3.875 stitches per inch, implies to me that "quick-gauge stockinette" is a loosely stitched fabric. As I mentioned above, I am leery of too loose a stitch, as the garment tends to grow. At the moment, I am quite content to forge ahead with the US 9 needles and larger pattern size; however, I will cannibalize the US 7 swatch and try again with US 10 needles...because it is the right thing to do, and I am damned curious what needle will give me this gauge. If anyone is wondering how I know exactly what needles I used for each swatch, I do not rely on my memory. I tie little knots in the tail. The number of knots equals the size of the needle. Here, I used a US 8 needle. I have no doubt, I will keep everyone posted.